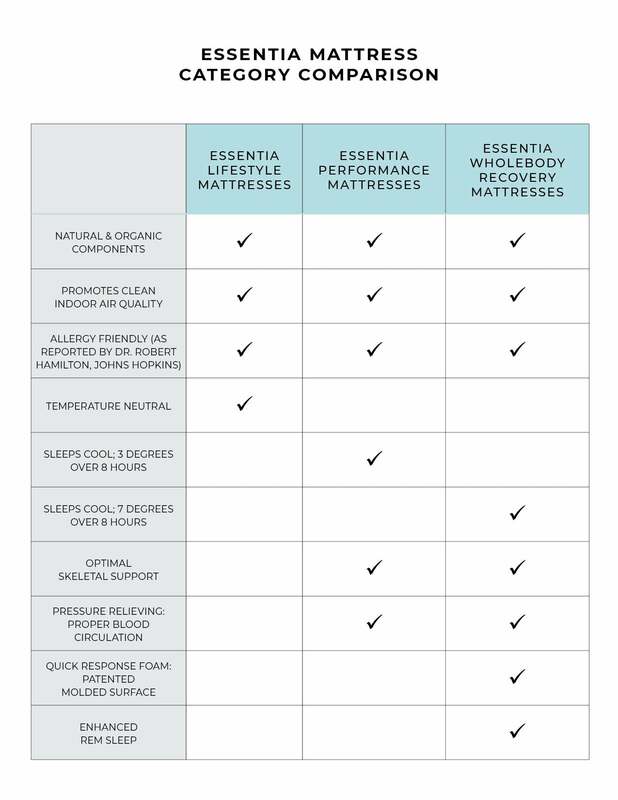 Eluxe a plush, cradling, natural memory foam mattress | Essentia | Organic Essentia Mattress Inc.
Eluxe is the ultra adaptive foam formula of the Performance mattress collection. For the first time, the Performance category now offers contour options in all 3 styles: the mid-contour Classic 8, the deep contour Energie Opus, and now the Eluxe, luxe contour. Unlike any other mattress, Essentia again surpasses any foam in the quality and performance by creating the Eluxe formula natural memory foam. This ultra adaptive natural memory foam formula, found exclusively on Eluxe, increases elasticity while also increasing density. This assures the highest level of support and durability while creating the plushest, sumptuous, cradling feel. Essentia mattresses are hypoallergenic as they do not have wool or fiber batting that act as nesting grounds for dust mites. Moreover, the natural memory foam and core of Essentia mattresses are impervious to dust mites as reported by Dr. Robert G. Hamilton of the Johns Hopkins School of Medicine. Made in Essentia’s GOLS and GOTS certified organic factory using only the highest quality natural and organic ingredients the Energie Opus reduces VOC exposure and promotes a clean air environment. Offering a Luxe contour, Eluxe offers an incredibly supportive and outrageously comfortable feel. Experience pressure relief and pronounced adaptive contouring especially at the shoulders and hips. This type of feel is often preferred by those who have a pronounced spinal curve or enjoy the feel of being cradled by their mattress as the Eluxe eliminates any negative space between your body and the mattress. The firm natural support core ensures proper spinal alignment for more comfort and better pain recovery. Eluxe ultra adaptive, plush feel makes it perfect for a sleeper looking for a sumptuous, cradling sleep experience. Made in Essentia’s GOLS and GOTS certified organic factory, there are no chemical flame retardants used on any Essentia product. 2 Layers of Patented Natural Memory Foam: 2 inch Eluxe formula ultra adaptive natural memory foam on top of a 2 inch 5.25 density natural memory foam. This GOTS certified organic cover features a full zip making it easy to remove and washable. 4 inch natural support foam gradually transitions to your body offering proper spinal alignment for support that doesn’t bottom out.